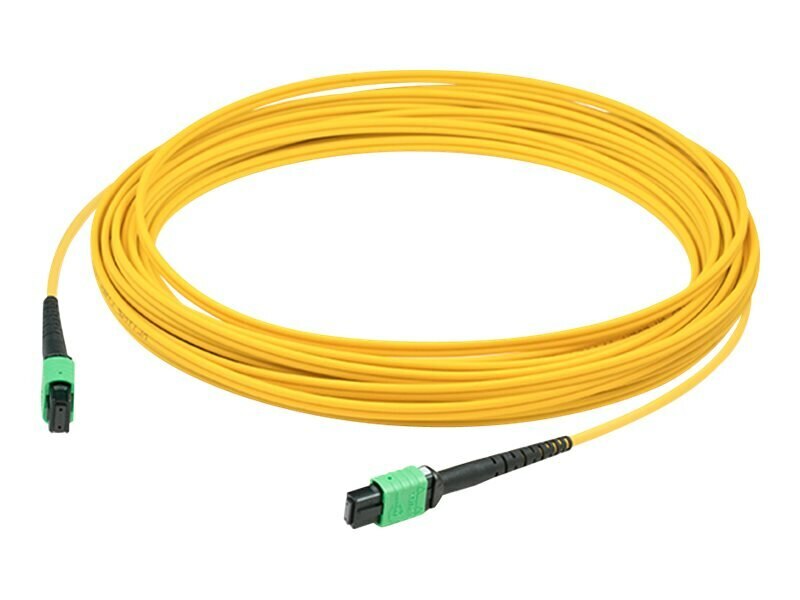 This is a 10m single-mode fiber (SMF) male to male MPO/MPO OS1 crossover yellow patch cable. Crossover cables are typically used for direct interconnect of electronic devices, and are commonly referred to as Type B MPO array cable. This high-density 9/125 cable accomodates 12 fibers (6 duplex circuits), providing savings in circuit card and rack space. In addition, it accomodates speeds up to 40 gigabits, commonly used in QSFP applications. This patch cable is recommended for connections between fiber patch panels, hubs, switches, media converters and routers, etc. The patch cables are 100% compliant for all of your networking needs. They provide higher speeds and increased bandwidth, compared to conventional twisted-pair copper cable. Each cable is 100% optically tested for insertion loss before you take ownership. Now you have a cost effective solution to your network upgrade needs.